According to the American Academy of Dermatology, the unpleasant and sometimes painful skin breakouts of acne can affect 40 to 50 million Americans. Acne is most common in teenagers, but it can affect people regardless of age. 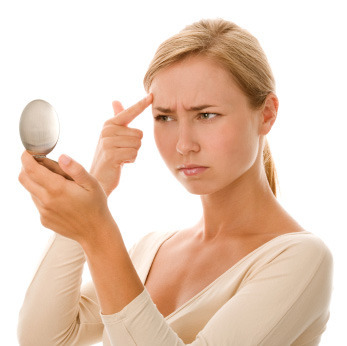 Hormonal acne is practically acne caused by hormonal fluctuations. Acne can flare at any time, but people are particularly susceptible to it during certain phases of life, including, and perhaps most famously, during puberty and adolescence in general. Adult acne, however, is also increasingly common. Much like adolescent acne, it is essentially hormonal in nature. Generally speaking, adult women tend to be more vulnerable to hormonal acne than adult men, but men can certainly experience it as well. Women tend to go through several different hormonal stages in their lives, starting with menses (the onset of menstruation), followed by many years of menstruation, perhaps a pregnancy or multiple pregnancies, premenopausal, and finally, menopause. Any or all of these new phases can change a woman's hormonal balance yet again and cause her acne to flare anew. Hormonal acne typically does not respond to traditional acne treatments, such as topical retinoids or antibiotics. Hormonal acne can be treated through the use of oral contraceptives for women and Accutane for men. Men and women who are experiencing hormonal acne find that over the counter topical treatments, such as ointments and cleansers containing benzoyl peroxide and/or glycolic acid, provide them with all the acne relief they need. Aleve is an over the counter medication that has been found to alleviate premenstrual acne and menstrual acne in many women because of the anti-inflammatory effect that it has on a person's entire system. However, Aleve which contains Naproxen, is an NSAID medication, which means that it is not safe for everyone to take. For instance, people who are allergic to aspirin should not take Aleve. AcnEase is an all natural herbal medicine that specifically inhibits the impact of fluctuating hormone levels on sebaceous gland secretions. AcnEase does not affect hormone levels but rather they modulate their effect on sebaceous gland secretions. This mechanism is effective in treating adolescent and adult acne. 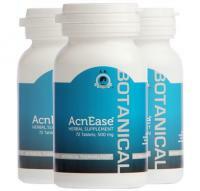 Likewise, AcnEase can be used by both men and women. But most importantly, AcnEase is safe and by addressing the causes of acne it will prevent the future outbursts letting your skin to clear and to begin a healing process for skin scars and acne marks. There are also several natural and safe ways to treat hormonal acne. You can cleanse your skin twice daily with an oil-free cleanser. Daily cleansing will help to keep your skin clear of makeup, bacteria and other contaminants that can exacerbate your acne. Avoid cleansers that contain heavy soaps or scents as these can worsen your acne. It also helps to keep your skin hydrated using a moisturizer. You may think that you should avoid moisturizer in an effort to dry out your acne. However, moisturizer is actually essential to getting rid of your hormonal acne. If you don't moisturize, your skin will actually produce even more oil to make up for the dryness there.You can also use an oil-free moisturizer that won't clog your pores. You can try some home remedies for clearing hormonal acne. Mash up one clove of fresh garlic. Apply the mashed garlic to your acne and leave on overnight as this has been shown to reduce hormonal acne. You can also try mixing a solution of equal parts rose water and lime juice. Apply the mixture to your acne and leave it on for ½ hour. Rinse the solution off your face and moisturize as you normally would. A healthy diet, rich in nutrients and antioxidants can also help treat hormonal acne and maintain clear healthy skin. A nutritious diet promotes overall skin balance and health, thereby helping to eliminate your acne. Avoid caffeine, alcohol and excess sugar, all of which can exacerbate hormonal acne.